My Galaxy S4 is going back. Or rather, my wife's. But first, a back story. When the iPhone was first previewed in 2007, it's 3.5" capacitive touch screen was a thing of wonder. Those who had used tiny non-touch screens on Blackberries marveled at its size. Those of us who had used Treo and Windows Mobile smart phones or iPaq and Palm Pilot PDAs were amazed that a touch screen could perform so fluidly. When the phone hit the market, and people could finally get their hands on it, one of the greatest UI feats in recent memory quickly became apparent: the phone was a breeze to use with one hand. Left-handed or right-handed, it didn't matter; the phone rested comfortably in your palm and you did everything with your thumb. Sure you could use two hands when typing, and there were multi-touch gestures to zoom in on an image, but everything feature was available to use with one single finger. Fast forwarding a bit: Android debuted on the underpowered HTC Dream/T-Mobile G1, tried to compete with the iPhone and couldn't. Android caught up to the iPhone hardware wise, and then the user experience began to catch up. Finally, as Apple launched the iPhone 4 in 2010, Android device manufacturers decided bigger was better and, with the launch of the Samsung Galaxy S, went to a 4" screen. Soon after, the screen race was on. The Motorola Droid X launched with a 4.3" screen in July of 2010. In May of 2011, the Samsung Infuse appeared with a 4.5" screen and by October, the HTC Sensation was out with a 4.7" screen. 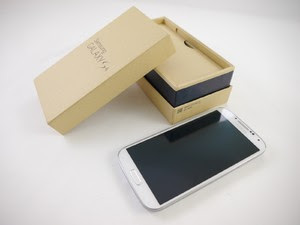 Last September, the Samsung Galaxy Note II debuted as a phone-tablet, or "phablet", with a 5.5" screen. Now, back to my wife's phone. Her Galaxy S4 was built around a 5" screen with a HD resolution of 1920x1080. She had upgraded from an iPhone 4 with a 3.5" screen with a non-HD resolution. The feature set of the latest Android phones -- big camera resolutions, big vibrant displays, fully featured Google Now integration -- had definitely tweaked her interest, and Apple's decision to swap from the trusty 30 pin connector to the Lightning plug, rendering all our iPhone accessories useless, did nothing to lure her towards a new iPhone. Her problems with the Galaxy S4 began almost immediately. Within hours of owning it, we had to run back to the mall for a better case because, in her words, "This thing is so brittle I'm going to break it". The newest generation of Android devices are essentially license plates -- big, flat, and super thin. Samsung choosing to use flimsy plastic for most of its structure doesn't help. Case applied, she spent the next few days attempting to use the S4 in her daily life. Even keeping it near her was troublesome, as the behemoth phone wouldn't fit anywhere. Pants pockets? No. Special phone pocket in her handbags? No. Convenient cutout in her dashboard that used to house the iPhone? No. Main compartment of her handbag it was -- good thing we bought screen protectors, too. The final straw came with her realization that practically every task on the Galaxy S4, including dialing a phone number, required both of her hands. We have a 17 month old with gazelle-like quickness and a fondness for permanent markers. Being able to dedicate two hands to any task is a rare luxury that often comes at the cost of a Sharpied rug or basset hound. Unable to sacrifice both hands to mundane tasks like texting, she went back to her trusty iPhone and boxed the S4 up to return. A quick glance at the available Android handsets shows nothing currently available from any major carrier with a screen smaller than 4.5". In a quest to stay competitive and offer what is perceived to be top-of-the-line equipment, every Android manufacturer has decided that bigger is better. By doing so, they are betting on trends and isolating their customers. Think back to the DeLorean or the Edsel. This has not worked well in the past. Oh, and the smallest screen on the market as of this writing? Just so happens to be the 4" iPhone 5. A screen size that, while larger than its predecessors, still accommodates single-hand operation.